The target was simple, we have an internal cloud datacenter at work that provides users and customers both virtual machines and physical machines. Each machine has to network interface cards (NICs), one is in control of the user/customer using SDN layer, the secondary NIC is for our support to monitor and help troubleshoot these machines when needed. This second NIC will be our target today. In the past we used per-user or per-customer firewall separations that was configuration intensive nightmare, but was reliable. However since we learned private VLANs are now supported by vmWares Distributed vSwitch (dvSwitch), we immediately tried to make it cooperate with private VLANs on physical switches. And since it worked like a charm, let me share with you a quick lab example. But theory first! Step #1: Find the dvSwitch entity and configure the VLAN 1000 as primary and 1001 as secondary – isolated. Step #2: In the configuration of the portgroup, where your VMs are connected to, assigned it to the isolated VLAN. So what can we do here to solve this between VMs and PMs ? Simple, teach the virtual switches the private VLANs principle of using dot1q tags on trunks. You see, the private VLAN standard declared a way how to do private vlan in multi-switch topology by using primary (for promiscous ports) and secondary VLAN tags (community/isolated) and marking packets based on these tags based on source port type whenever the switch needed to push the packet via a trunk. There is a nice explanation on packetlife.net here of this, so I will jump right at applying this to virtual switches. 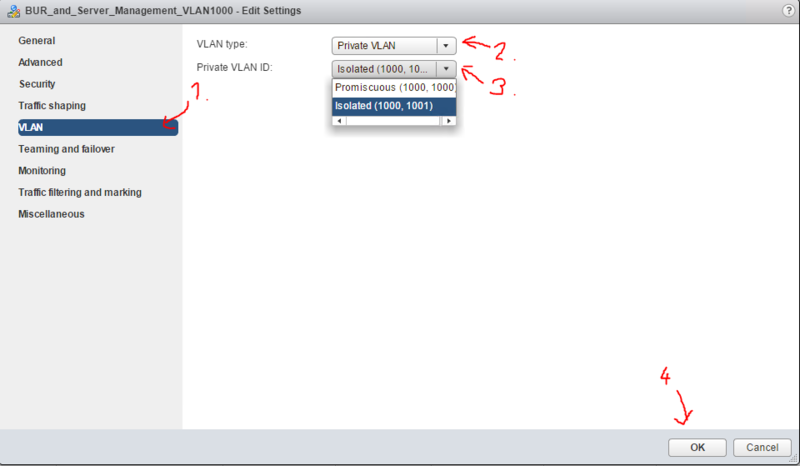 First, lets create in our lab two VLAN tag IDs, I will use VLAN 1000 as primary and VLAN 1001 as secondary. Now let’s get practical, this was my lab setup below on picture. Target is to achieve complete isolation of all VMs and PMs on the network, while at the same time allow all these systems to use default gateway, which was a VRRP IP on interface vlan on the switches. I was using ESX hosts version 6.0 and HPN 5940 series switches with Comware 7 – R2508 version. Well, that is, only a few extra commands on top of the very familiar vlan declarations and interface configurations, so this should not be any issue for you. And I would guess also for other vendors. Moving on to the vmWare world, this part was actually what I didn’t know originally and needed to research (link below in external guides links). But it is very easy indeed as this is really just a few configuration steps on a centralized dvSwitch settings. Note/Disclaimer: This guide expects that you have an ESX host that is using a Distributed vSwitch (dvSwitch) deployed across all your ESX nodes. In my lab I had two nodes called Node #1 and Node #2 (as visible in the lab topology picture above). As was our target all along, after this configuration, all the VMs and the physical server in the topology are not capable of accessing each other as they are members of the isolated secondary VLAN 1001, but they can access the promiscuous gateway interface (hosting VRRP gateway IP) because it is assigned to primary VLAN 1000. Thank you for the explanation! In our case we don’t use vrrp so we want the traffic reach the router. There is surprisingly little information about this case in the posts in the internet as if everybody isolates the server from the internet too which is hardly ever the case. It would be simple if routers would accept the configuration of private vlans — just configure it there and add all related vlans into all trunks between the router and private vlan switch. But this seems more like a switch L2 feature and our Fortigate didn’t have any such configuration available. After this, the next switch behind the uplink port didn’t need VLAN 1001 anymore, the previous command put the VLANs’ traffic “suitably” into VLAN 1000. Also, in our case we didn’t have any other physical servers (or other customers) so we didn’t have to take care of any ports of the switch, just tagged them all with all VLANs.